Happy spring! Here’s an illustrated list of Tokyo’s best cherry blossoms (sakura). To see more photos of each spot, click on the photo or name of the site. 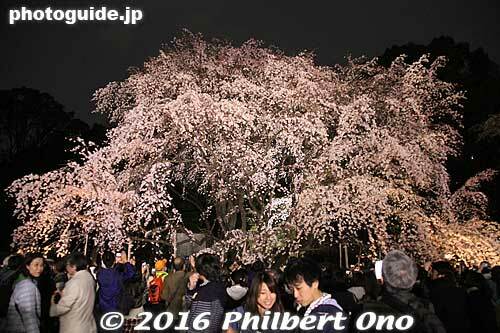 One of Tokyo’s biggest outdoor hanami parties are held in Ueno. The best spots are reserved hours in advance with tarps. Cherries are also lit up at night. 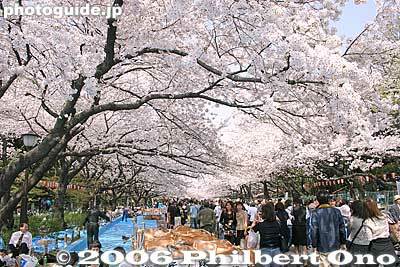 If you want to know what hanami is like, come to Ueno. Lots of museums too. 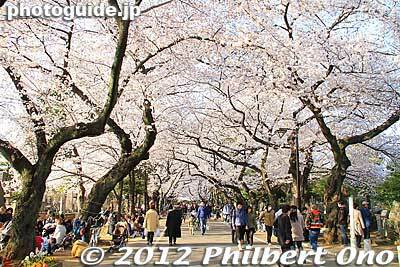 To escape the madness of Ueno Park, go to the adjacent Shinobazu Pond, picturesque for a stroll through the sakura. Near Ueno Station. Cherry blossoms along the huge moat of the Imperial Palace (former Edo Castle) makes this one of Tokyo’s most photogenic spots. 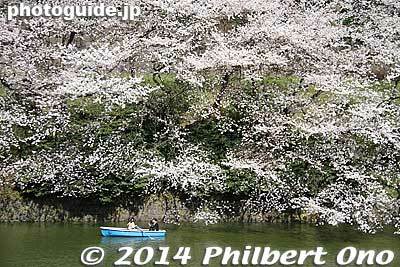 There is a pleasant path to walk through the cherries as well as rowboats on the moat. Be prepared for the crowds. Also beautiful at night. Near Kudanshita Station (Tozai Line). After Ueno Park, this huge garden-park is massively popular for hanami picnics. Unlike Ueno Park, there’s lots of open, grassy space and room for picnickers. Garden itself is great to walk around too. Near Shinjuku Gyoen-mae Station on the Marunouchi Line. 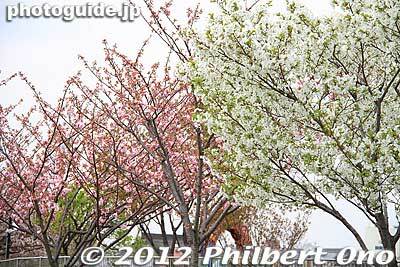 Riverside park near Asakusa is lined with many cherry trees on both sides of Sumida River. Mainly for people to stroll under the trees. 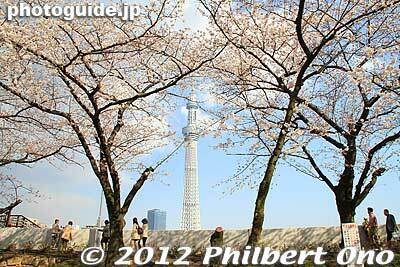 The main draw for photographers is the cherry blossoms with Tokyo Skytree in the background. Flowers and Skytree both lit up at night too. Near Asakusa Station. If you’re American, definitely check out this park. This is where the famous cherry trees in Washington, DC came from in 1912. This park is in the Kohoku Village area famous for colorful varieties of cherry blossoms. Literally called “goshiki” or five colors. Sadly, they all died, so saplings from the Washington, DC cherry trees were brought over here and replanted here 30 years ago. These trees are called “homecoming trees” (里帰りの桜). You can see descendants of Washington, DC cherry trees thriving here. They must be happy to be in the land of their ancestors. Adachi Ward also has a “Reagan Sakura” tree planted at Toneri Park from a sapling presented by Nancy Reagan in 1981. From Nishi-Arai Station on Tobu Railway, take a bus for Toshi Nogyo Koen Park. Takes about 20-30 min. If you like temples and samurai, this is the place. Zojoji was the official temple of the Tokugawa shoguns. You can see the tombs of some of the shoguns and their wives and children. Tokyo Tower is also in the background. 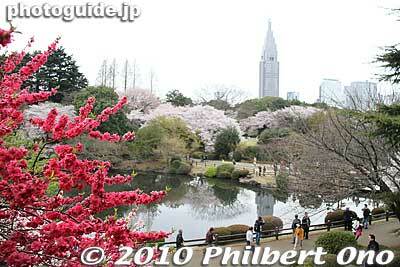 Neighboring Shiba Park also has fine views of Tokyo Tower and cherry blossoms. Near Onarimon Station on the Mita subway line, Daimon Station on the Toei Oedo and Asakusa subway lines, and JR Hamamatsu-cho Station. Inokashira Park has always been a local favorite. 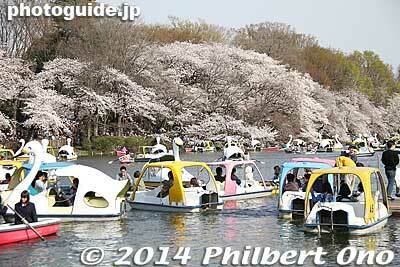 The highlight is renting a rowboat on the sakura-fringed pond. There’s hardly any grass to sit on, so bring a picnic mat. There’s also a zoo with Hanako, Japan’s oldest elephant. Near Kichijoji Station. I would call this the biggest and most impressive sakura spot in western Tokyo. When in full bloom, the trees are just fantastic. Within the park is the Edo-Tokyo Open-Air Architectural Museum, an outdoor museum of architecture of 27 reconstructed buildings originally from the Edo Period and up to the 1930s. Near Musashi-Koganei Station on the Chuo Line. If you go to Chidorigafuchi, you might as well see Yasukuni Shrine across the street. The blooming of one sakura tree there serves as Tokyo’s barometer for the weather bureau to officially declare that cherry blossoms have started blooming in Tokyo. Near Kudanshita Station on the Tozai Line. Rikugien is one of two of Edo’s famous gardens (other is Koishikawa Korakuen). It has a beautiful weeping cherry tree. Expect a line at the entrance when the tree is in bloom. Also lit up at night. Near Komagome Station on the Yamanote Line. Koishikawa Korakuen is another famous Edo-Period Japanese garden. Originally built by Lord Yorifusa of the Mito Tokugawa Clan in 1629 as part of his Edo estate. The garden was completed under Lord Mitsukuni, the second lord of the Mito clan. 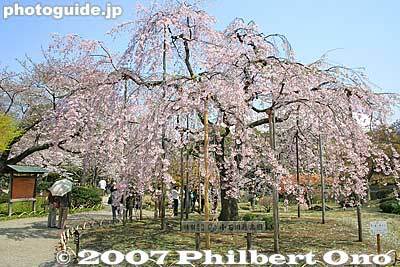 Famous for weeping cherry trees and other flowers. Near Iiidabashi Station and Korakuen Station. Harimazaka road, named after Lord Matsudaira Harima who had his main residence here during the Edo Period, is lined with 127 cherry blossom trees for about 460 meters along a wide, central median. The cherry trees were planted in 1960. A few outdoor sculptures complement the trees. On weekends, the road is closed to traffic so we can enjoy the blossoms more. Near Myogadani Station on the Marunouchi Line. 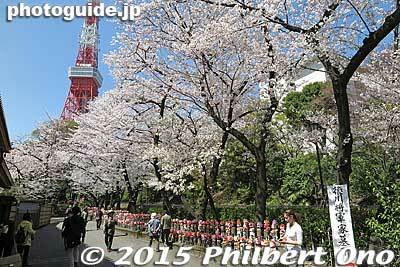 Most of Tokyo’s major cemeteries have cherry blossoms. Yanaka has a lot of them. 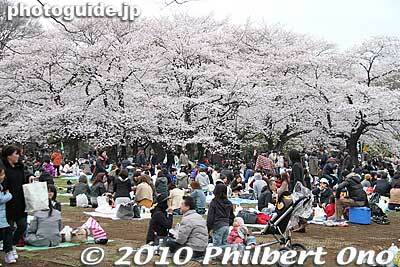 They also allow hanami picnics. Interesting contrast with gravestones. Then again, it might make the departed souls happy to be in their midst. The cemetery is noted for graves of famous people like actor Hisaya Morishige, Eiichi Shibusawa, Yokozuna Dewanoumi, artist Taikan Yokoyama, and the last Tokugawa shogun Yoshinobu, but they are off limits to the public. Tennoji temple is also nice to visit. Near JR Nippori Station. Very crowded in the evening when the cherry blossoms are lit up. No picnicking allowed. Just stroll and look. However, the roads are narrow and passing cars are a nuisance. Near Naka-Meguro Station (Hibiya Line). Another park popular for hanami. Smaller than Ueno Park and Shinjuku Gyoen Garden. 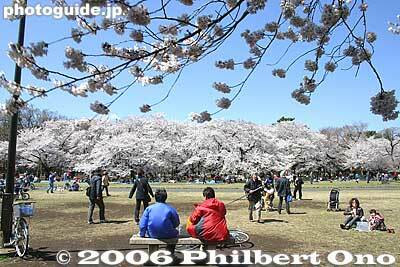 There is more open space than cherry trees, so many people picnic under the sky instead of a cherry tree. Very long lines for restrooms, especially for ladies. Near Yoyogi-Koen Station on the Chiyoda Line. 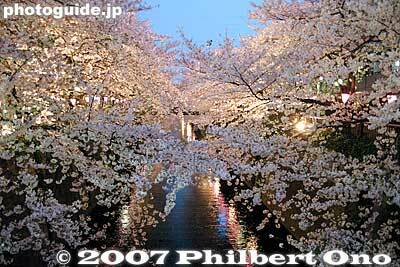 Ride the Chuo Line or Sobu Line in central Tokyo and you will see the cherry blossoms along the parallel moat. Formerly a moat of Edo Castle, this canal stretching from Iidabashi Station to Ichigaya Station along the Chuo Line. 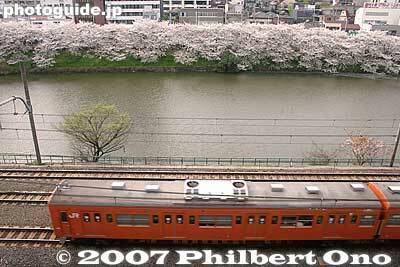 For train fans who like to shoot trains and cherry blossoms. Aoyama Cemetery (青山霊園) – Minato Ward, Near Gaienmae Station (Ginza/Hanzomon Line) and Nogizaka Station (Chiyoda Line). Asukayama Park (飛鳥山公園) – Kita Ward, Near Oji Station on the Keihin-Tohoku Line. 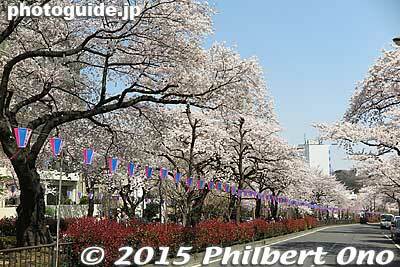 Fuchu Sakura Matsuri (府中市民桜まつり) – Fuchu, Near Fuchu Station on the Keio Line from Shinjuku. Kunitachi Daigaku-dori (国立大学通り〜さくら通り) – Near JR Kunitachi Station. Nakano-dori – Nakano Ward, Near Nakano Station. Senzoku-ike Pond (洗足池) – Ota Ward, Near Senzoku-Ike Station on the Tokyu Ikegami Line. 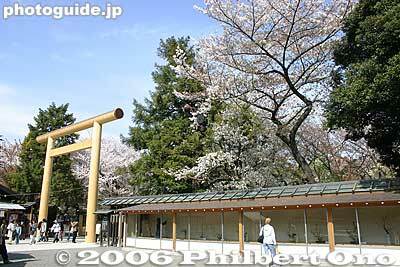 Showa Kinen Park (昭和記念公園) – Tachikawa, near JR Nishi-Tachikawa Station. Shakujii Park (石神井公園) – Nerima-ku, Near Shakujii-Koen Station on the Seibu Ikebukuro Line. Tama Cemetery (多摩霊園) – Fuchu, Near Tama Station on the Seibu Tamagawa Line or a 2-minute walk from Reien Omotemon bus stop via Keio Bus from JR Musashi-koganei Station. Shakujii River Cherry Blossoms (石神井川の桜並木) – Itabashi-ku, near Shin-Itabashi Station on the Mita subway line.